In Part I of my Gen Con 50: When You Give Catella a Press Pass series, I discussed some general observations on my first Gen Con as well as what seems to set Gen Con apart from other geek conventions. This second part of my Gen Con series is what I’m calling Critical Rolls and covers my favorite, most memorable experiences that definitely merit further discussion. Our fiery, feisty, and talented best friend Liam of Sandy Pug Games (DriveThruRPG link here) was GMing an RPG he wrote called The Infernal Bone Machine, which used the Dungeon World system. If you’re unfamiliar with Dungeon World, it focuses less on the necessity of dice rolling for every action and instead focuses on the storytelling derived from the players. As someone with attention span issues, I’ve always found Dungeon World to be one of the easiest, most enjoyable systems to participate in. That coupled with Liam being my usual GM at home meant I was game (pun) to give it a shot, even though it was my first event of a new convention and also meant I’d be gaming with mostly strangers. Liam had prepared some of his own pre-made character sheets (including the Necromancer, which I played) as well default Dungeon World character sheets. Besides my husband and me, there were (I believe) six other players that had showed up for the game. We filled in our character sheets by Liam’s guidelines and then he started us off running. Essentially, we were a group for hire that had been hired by a famous, powerful lich. The lich had created a computer-esque golem that had suddenly ceased working. Our job was to portal into the golem and figure out what had gone wrong. I can honestly say, even though my best friend was running the game and my husband was sitting next to me, I was still supremely nervous and uneasy about being a player in an RPG with so many people I’d never met. I’ve played multiple RPGs in multiple systems, but with friends, or maybe one person I didn’t know. But you know what? Playing with a bunch of people you don’t know can be liberating. Not only were these people charming, engaging, and fun, they were also kind. Even when I didn’t know what I should roll or if I attempted a move that couldn’t really be done, no one ridiculed me. Instead, they helped clarify why I would roll as I did or suggest a different maneuver. We were players of a variety of ages, genders, races and ability. We were varying levels of RPG players, ranging from very first game to the best druid I’ve ever seen in my life. None of this mattered, only that we worked as a team and regarded each other with decency and respect. Will this be the case in every game? I doubt it. But this was my first game at Gen Con, and was actually quite indicative of how mesmerizing and surprisingly fluid all of my encounters would be for the rest of the convention. If you’re unaware of what LARPing is, it’s live-action role playing. Instead of rolling dice and having turn-based interactions with a GM, LARPing incorporates varying levels of scenery, costumes and interactions which are carried out in character by essentially method acting. My truthbomb is that I’ve never LARPed. To be honest, I have a weird mental block against it. 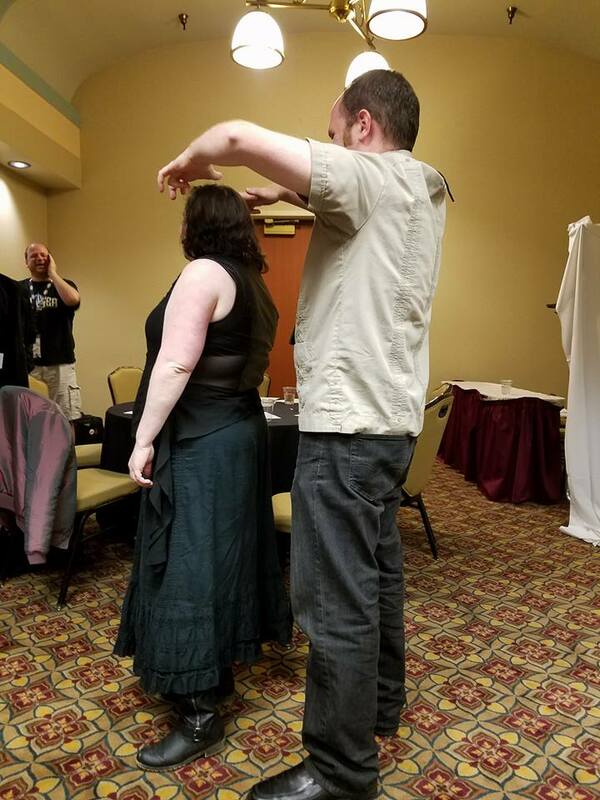 I mean, yeah, I’m a long-time actress with plenty of experience, and I’m also in the SCA (Society for Creative Anachronism), but let’s just say the SCA is not quite the same as RPG LARPing. 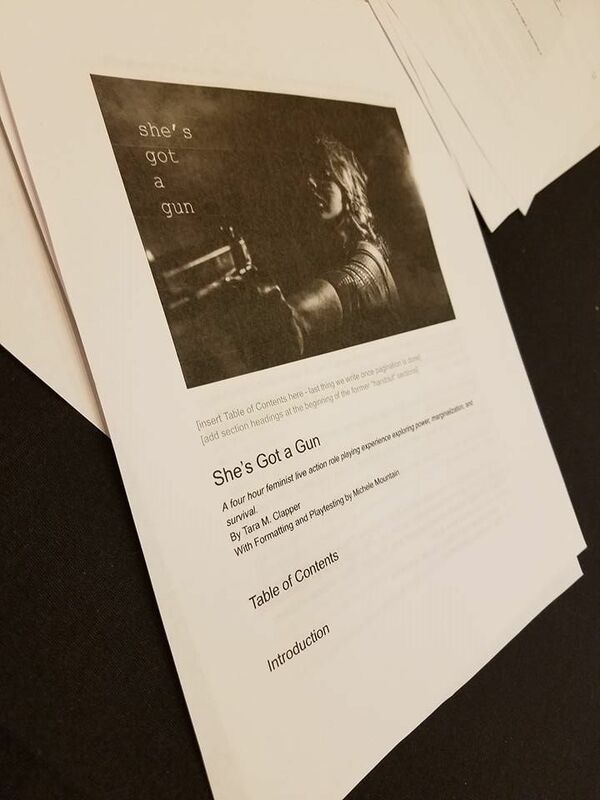 But when Tara, my mentor, editor, and founder of this fine establishment (TGI, that is), announced she was going to be running a LARP at Gen Con that she had written and created, I was eager to support her. The tickets sold out in the first 30 minutes of selling in the months before Gen Con. I said I’d be happy to, instead of playing, document and observe the LARP. Friday morning, after more instances of creative cursing and getting lost in the oddly-labyrinthine Indianapolis Convention Center, I found the room and snuck in. Tara introduced me to her well-rounded group of participants that were already seated with game papers in front of them. I was strikingly impressed by Tara’s boundaries for the game. The above summary renders quite obviously that this can be an explosive, raw experience, and I wasn’t sure how safeguards would work. But she explicitly and in no uncertain terms set standards for all gamers involved that encouraged true emotional engagement, but also prevented unnecessary emotional damage to self and others. Rules such as “If you use any type of real world slur, you are absolutely ejected from the game” and use (given hand symbol) to indicate you needed to leave, whether temporarily or permanently, and don’t wish to be followed were at the top of discussions. The crew (team of players) had a few round table discussions and ultimately decided that, among the scenarios Tara presented, they would tweak one and would be on a space cruise ship in which they were all AI staff and the last humans had died. Sometimes in LARP, an AI just needs to borrow a dead captain to use as a marionette. NBD. This was a peculiar, fascinating way to look at the human experience: through the eyes of non-humans. Tara was as surprised by the outcome as I was and marveled that of the four or five times the game had been previously run, this was the most unique culmination. It was evident that every single LARPer in the game hadn’t just LARPed before, but that they were talented, committed and experienced LARPers. Despite a few of the players knowing one another, plenty of them were strangers to one another. They were respectful and thoughtful in their debates of who their characters would be and how they would interact in the larger aspect. But as soon as the room was set up and Tara’s co-GM Matt commenced the game, the players were transported in mind, “body” (I mean, as “body”-ish as an AI gets) and soul. They were devoted. And impressive. As a non-LARPer, one of the first things I was also fascinated by was not only the immediate commitment, but the layering that occurred. It was actually almost a bit overwhelming, initially. Tara, functioning as an AI with the captain’s memory, was wandering around proclaiming what the captain would have wanted. Meanwhile, there were two or three other groups of characters interacting with one another and then wandering into other groups. LARPing, despite being an RPG, is very different than tabletop gaming. There’s a lot of focus and observation to be maintained while also preserving your character’s integrity and interests. 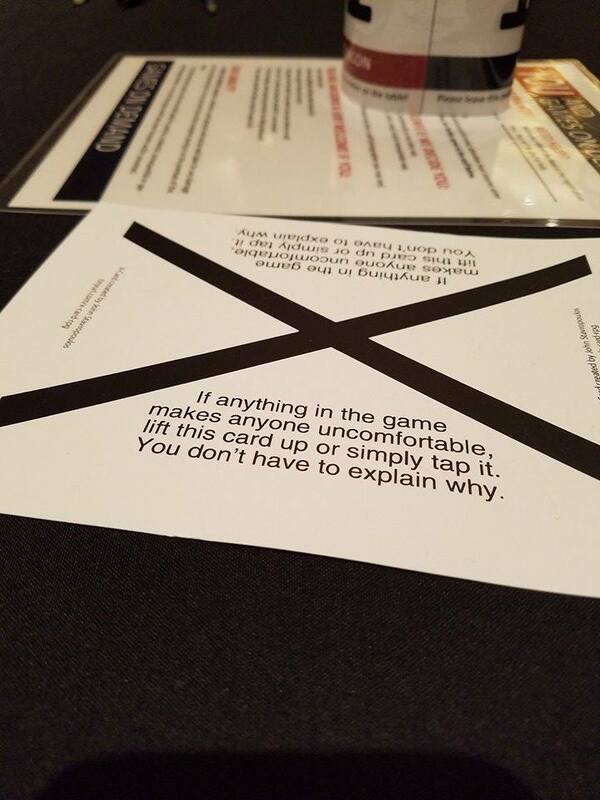 It’s not turn based, which is a factor that makes tabletop a bit more laid back. I think the next time I’m around a LARP, I’ll give it a go. Probably the most important part of LARPing, as I learned and observed, isn’t the commitment or ability demonstrated by the players, it’s the comprehension and embracing of emotional safety boundaries. Those elements are what make the experience secure, separable and savorable. I started cosplaying back in 2004 or so. The conventions I’ve been to, as I’ve mentioned, were mostly anime conventions. These types of conventions are absolutely overflowing and brimming with cosplay at every level, from basic to beginner to professional to hired. Gen Con’s cosplay is a bit different than standard anime conventions, though. First of all, I didn’t feel naked or like I was being stared down on the days that I DIDN’T dress up. It was a glorious change to how I’d feel wearing a t-shirt at an anime convention. Some days, I just wanted to wear something easy to put on and focus on the convention. But some days, I also wanted all of the glory that comes with cosplay, including getting up way too early and yelling at wigs. Overall, anime conventions, while mostly unintentionally, make you feel as though cosplay is inevitable and required. Gen Con did not. I wore Steven Universe on my first full day at Gen Con. Didn’t do a wig, just let my long black hair down. Still had jeans, the star t-shirt and red flip-flops, but no wigs. A couple of mentions of how great Steven Universe is, but considering the vast amount of people, not what I expected, but also wasn’t upset. I was pretty distracted myself. I was also feeling quite self-conscious because my shirt was a size too small, but no one cared. Besides, having pudge is practically necessary for Steven Universe! 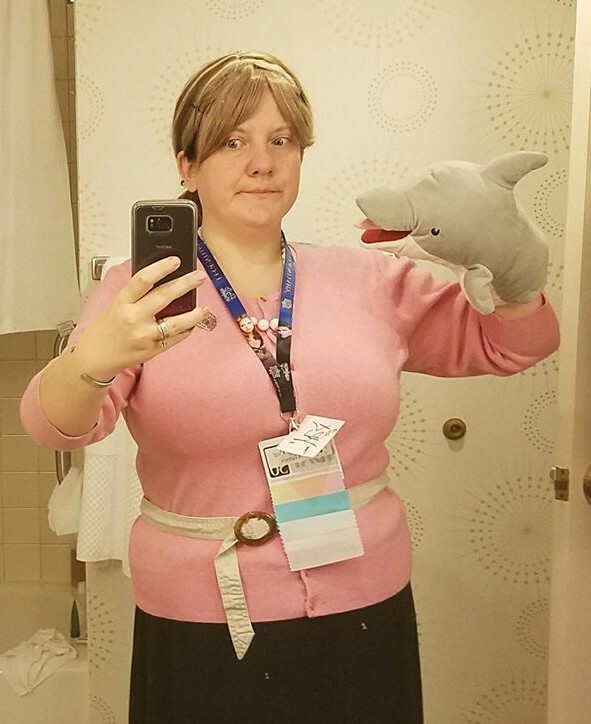 The second day I cosplayed, I went as Pam Poovey. My cosplay of her went viral a while back and I’m particularly fond of it because I’m particularly fond of her and am very similar to her in personality. That day we walked around the Vendor’s Hall and Artist’s Alley. I got a lot of vendors telling me I was badass or saying “Oh, hey Pam. How’s it going?” to which I’d give a Pam reply. “Thank god for them Internets.” Me as Pam Poovey from Archer. One of our friends also noted to me later that it’s possible that I didn’t get as many comments as usual because people were intimidated by my walker. He noted that such would be a dumb reason, but that it was possible. If you were or are one of these people intimidated by disabilities, uh, please don’t be? People with disabilities are, shocker, still people. Tell them their cosplays are ridonk if they are! Tell them you can’t believe how much time they put into their props! Make the same comments you’d make towards abled-bodied cosplayers. And no, you can’t comment on their assistive devices. Just their cosplay. Anyway, besides the 32nd Annual Cosplay Contest held on August 19th (Saturday) and the Cosplay Parade (also Saturday), there was also a wall where cosplayers could line-up and pose in front for anyone wanting their picture. This was kinda a heaven send compared to anime conventions, where halls get clogged with photos being taken every 2 seconds or 3 feet and inadvertently tripping on stopped fanpeople. Here, anyone could take a picture and anyone could pose. There were gamers just taking photos of their favorite characters all the way up through professional photographers that would later post galleries on their sites. 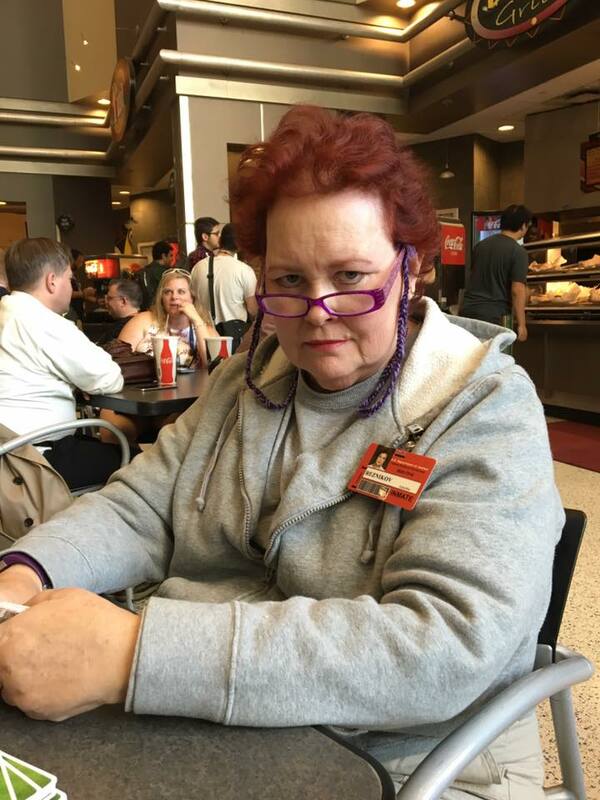 Liz as Red from Orange is the New Black. 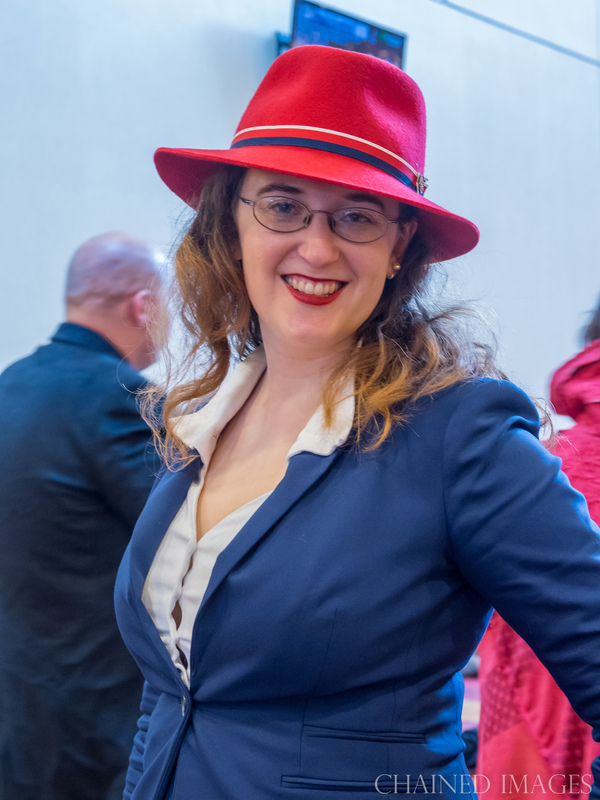 Picture courtesy of/used with permission of Liz M.
Photo of Emi L. as Agent Carter by Chained Images. Agreed and well-said on both accounts! Despite all of us being human and having insecurities, Gen Con seemed to foster a positive, productive atmosphere for cosplay at all levels, not just high-tier. Gratefully, though, that same atmosphere also made it okay for me to just wear a dress or jeans on days I didn’t have enough energy to give the necessary sacrifices to the Cosplay Gods. GM on Demand was highly addicting. So, you know all the annoying parts of starting a new tabletop RPG game? Getting people to arrive on time, deciding which game, the dreaded character gen? You don’t have dice? Why wouldn’t you bring dice? [I didn’t bring dice] Well, with GM on Demand, all of those wild inconveniences are magically erased. First, you show up either by yourself or with a group. You pick up a reservation card for the amount of people playing. While waiting for the games to start (which is always on-time, thank goodness/ugh at normal games), you get to browse what systems and games you want to play. The reservation numbers get called, you select your chosen game and are directed to a table. This was another exceptional feature. If anything made you uncomfortable, tap the sign and it’d end. Especially helpful when you’re around lots of new people you don’t know. At that table, your gallant GM awaits. They have conveniently pre-made games in systems which they are quite familiar with. The character gen? Done. You just pick which character you want. In some games, you can add or change a few things, but largely, the game is set. Your GM gives you info, you get names and for 2 or 4 hours (depending on which type you selected), you and your friends are enjoying all of the BEST parts of roleplaying, instead of the obnoxious, humdrum parts. I wasn’t sure I’d like idea either, as I’m not widely familiar enough with of the various RPG systems to feel comfortable jumping in anywhere, but we easily made it work. The GMs that we had were kind, helpful and funny, and knew what they were doing. Even though I hadn’t played some of the systems, it was a snap to figure out with their guidance. This was honestly one of my favorite features at Gen Con. Cost was one generic ticket per person for two hours, two for four hours. There were definitely monumental ideas and events tearing at the seams at Gen Con. The most frustrating part is that for how many events you want to get to, there are so many hours in the day. I’ve heard this wanderlust doesn’t really get better no matter how many Gen Cons you go to. There will always be more events you wish you got to, no matter how well your time was spent.